Featured Image: Philip Jackson, Lehigh Valley market president, Univest Bank and Trust Co.; Pam Hartnett, Board Secretary, Meals on Wheels of Lehigh County; Lisa Luciano, Board Chair, Meals on Wheels of Lehigh County; Deb Cummins, Interim Executive Director, Meals on Wheels of Lehigh County; and Mike Keim, president, Univest Bank and Trust Co.
August 10, 2018 – Univest Bank and Trust Co. recently presented Meals on Wheels of Lehigh County with a check for $2,500 earned through the Lehigh Valley IronPigs “Double Plays Pay” sponsorship. 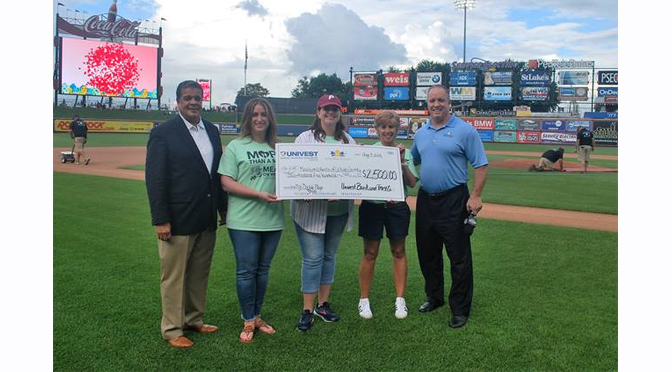 Each time the IronPigs made a double play, Univest provided a $25 donation to Meals on Wheels. Univest Bank and Trust Co. has participated in the IronPigs “Double Play Pay” sponsorship since 2009 helping a different nonprofit each year including the Community Music School, Lehigh Valley Zoo, Boys & Girls Club of Allentown, Big Brothers Big Sisters Lehigh Valley, Dream Come True, Valley Youth House and The Fund to Benefit Children & Youth. Univest supports a variety of nonprofit organizations throughout its service area of southeastern Pennsylvania which extends to the Lehigh Valley and Lancaster. In 2017, Univest’s Committed To Local philanthropic giving program made contributions totaling more than $1.8 million to support groups that make a positive difference in the communities it serves. Meals on Wheels of Lehigh County is a local non-profit organization that serves seniors or adults with disabilities who are primarily homebound and unable to cook or shop for themselves. Our services include meal delivery, well-being checks, friendly visits, grocery shopping, emergency meals for when we can’t deliver, pet food for clients with pets and linking clients to other services to help them live independently and stay healthy in their own homes.